Customers love United Cutlery’s new Hellfire Damascus steel, an elaborately patterned black Damascus steel exclusive to a single forge, worldwide. Hellfire Damascus is intricately patterned with hundreds, often thousands of contrasting lines, each a distinct layer of steel. Damascus steel is beautiful, but Hellfire Damascus is on a whole other plane of breathtaking. United Cutlery (UC) – a multi-brand knife, sword and licensed movie replica manufacturer based in southern Georgia – says consumer enthusiasm for its acclaimed Honshu Boshin line has soared from “hot” to “Hellfire-hot” since the November 2017 release of two special editions of its best-selling Honshu Boshin Katana and Honshu Boshin Wakizashi. The new swords feature showier, collectability-enhancing blades, hand forged from “Hellfire” Damascus Steel – an elaborately patterned, shadowy hued variant of Damascus steel exclusive to only a single forge, worldwide. Like steel snowflakes, the patterning on no two “Hellfire” Boshin blades is exactly alike, but they’re all equally “stunning,” UC president Clint Kadel says. Beyond the blade, Honshu’s Hellfire Boshins retain the same dimensions, feel, modern materials and traditional-Japanese-meets-contemporary-tactical aesthetics for which their original counterparts are so renowned. This distinctly “Boshin” style is the brainchild of legendary cutlery designer and fantasy artist Kit Rae. Around 2013, Kadel asked Rae to develop a sword line unlike any UC had ever attempted - centuries-old, battle-proven Japanese sword styles, reimagined and retooled to satisfy the unique tactical challenges and aesthetic tastes of the modern era. Kadel immediately set to work, drawing inspiration from some of his earlier designs. Combining such groundbreaking sword designs with such a unique steel variety as Hellfire Damascus only seems natural, Rae adds. “The Hellfire Damascus version is more for the sword collectors, something a bit more artistically customized. It goes back to pairing the old traditions with the modern,” he continues, referring to Damascus steel’s ancient roots. Indeed, like the Boshin swords themselves, Hellfire Damascus is a contemporary spin on an ancient steel breed. “Original” Damascus traces its roots back centuries, drawing its name from the city of Damascus, Syria, where smiths were forging a similar pattern welded steel at least as early as the Middle Ages. Christian Crusaders of the era often encountered the novel steel during their campaigns in the Holy Land. They discovered it to be a far superior sword blade steel than anything produced by European smiths at the time, and many knights commissioned their own swords made from the resilient new steel, which they dubbed “Damascus.” Upon the culmination of Crusades, knights returned home to Western Europe with their new Damascus steel swords in tow. Word spread and a market for Damascus weaponry bloomed; eventually European smiths learned to replicate the Damascus technique and began forging wares from the highly sought-after steel. Like its predecessor steel, Hellfire Damascus is intricately patterned with hundreds, often thousands of contrasting lines, each a distinct layer of steel. To achieve this ornate figure, smiths repeatedly fire, fold and hammer weld multiple strips of different steel alloys, before a final acid treatment highlights the vivid contrasts between individual layers. The slow, labor-intensive technique has changed little since Damascus Steel’s earliest days. When forging the blades for Honshu’s special “Hellfire” edition Boshins, however, United Cutlery’s master swordsmiths add another step – an exclusive metallurgical process that colors the steel’s elaborate ripples, waves, swirls and other patterns with variegated shades of amber, fire, scarlet, tawny, onyx and more - effectively putting the “Hellfire” in “Hellfire Damascus.” Inventive, though it is, the process was somewhat of a chance discovery, recalls Rae, who played a key role in “Hellfire’s” discovery and early development. UC’s smiths stumbled on the process while forging similar “Black Damascus” steel for another Kit Rae-designed sword. Some of the elemental metals involved in the Black Damascus process were added at incorrect quantities, yielding vibrant red and bronze tones, in addition to the intended black. And the rest is history. “This type of black Damascus, which is sometimes called ‘red Damascus,’ is a recent development. We were developing a black Damascus version of one of my fantasy swords about 10 years ago and happened upon the process completely by accident,” Rae recalls. Though the specifics of the Hellfire Damascus process are a closely guarded secret, in simplest terms it’s a “copper/nickel bonding process,” Rae explains. He adds that in addition to color transformation, the process affords “a protective layer,” making Hellfire Damascus more resilient and corrosion resistant than ordinary, untreated Damascus. 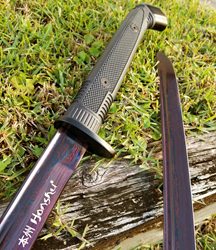 Honshu’s new special edition Boshins are two of just a few dozen sword models worldwide outfitted with the rare steel type, which is sometimes called “black-,” “red-,” or “black-and-red” Damascus. These alternative monikers are misnomers, however, as Hellfire Damascus is distinct from black- or red Damascus steels, which typically lack the vivid color variation of Hellfire. “Hellfire” or not, the exotic Damascus steel variety plus the Honshu Boshin equals a “match made in swordcraft heaven,” according to Kadel. Early numbers suggest the Hellfire Editions are well on their way to joining the original Boshin Katana and Boshin Wakizashi at the top of United Cutlery’s “best-sellers” list. Kadel expects demand to continue grow, asserting the Hellfire Boshins, as well as the entire Honshu Boshin line, have genuine staying power, even in a largely trend-driven knife and sword marketplace. Kadel continues, “The Boshin designs are hip, but not for its own sake. The difference in the Boshins and many other ‘on-trend’ knives and swords is substance. For example, the hilt is sleek and very contemporary looking, but, most importantly, it provides incredible hand-feel, firm grip and ideal weight counterbalance to the blade. And though many traditional katanas provide these things, too, on the Boshins they're better nuanced and fine-tuned to modern use, as opposed to mounted samurai in 15th century Japan. So even when design tastes change, these timeless qualities - this 'substance' - will ensure the Boshins stay relevant and popular 20, 30 years down the road." Honshu is one of dozens of United Cutlery brands, all of which are featured in the company’s annual master catalog and on its ecommerce website. In addition to knives, swords and other cutlery, UC brands produce a variety of self-defense tools, consumer electronics, and even movie prop reproductions. UC is the is the only cutlery firm in the United States licensed to replicate knives, swords, armor and other weaponry from numerous blockbuster films, including New Line’s “Lord of the Rings” and “Hobbit” trilogies, “The Expendables” series, “Star Trek: Nemesis” and many more. For more information on Honshu, United Cutlery and/or UC brands, visit http://www.unitedcutlery.com.